I have been wanting to try making a pastilla for a while now and when I saw a recipe for a chicken and date pastilla in this months Food & Drink magazine it was like fate as I still had a bunch of fresh medjool dates! 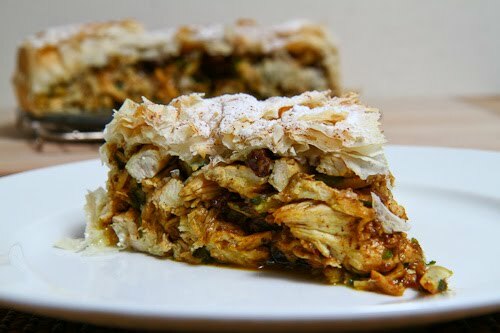 A pastilla (aka bastilla, bisteeya, b’steeya, bstilla and b’stilla) is a sweet and savoury Moroccan meat pie that is wrapped in light and flaky phyllo dough. The pastilla contains a lot of my favorite things from a good tagine including a really nice combination of Moroccan spices, tender meat, sweet dates and raisins, slivered almonds and fresh parsley and cilantro. 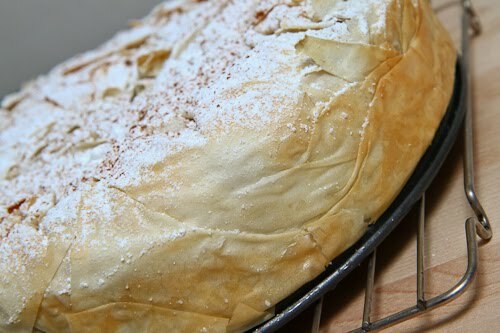 After the pie is baked until the phyllo is nice and golden brown, light and flaky it is dusted with icing sugar and cinnamon adding another nice layer of sweet to weave into the already complex dish. This pie takes a bit of effort to make but it is well worth the trouble! The pastilla is a perfect combination of sweet and savoury and the flavours, textures and the spicy aroma will just make you swoon. I am certainly looking forward to enjoying the leftovers! Add the chicken, skin down, brown and set aside. Add the onions and saute until tender, about 7-12 minutes. Add the garlic, cumin, ginger, cloves, cinnamon, chili flakes, turmeric and saffron and saute until fragrant, about a minute. Put the chicken back in the pan along with the stock, cover and simmer until the chicken is cooked, about 30 minutes. Remove the chicken, let it cool and shred it. Put the chicken back in the pan along with the eggs, dates, raisins, cilantro and almonds, mix and season with salt and pepper. Place a sheet of phyllo on your working surface and brush with the olive oil. Place a sheet of phyllo on top forming a plus sign and brush with olive oil and repeat until all sheets are done. Place the phyllo into a 9 inch spring form pan, fill with the chicken mixture and fold the overhanging phyllo over the top sealing the pie. Bake in a preheated 375F/190C oven until golden brown, about 30-40 minutes. Let cool and dust with icing sugar and cinnamon. That looks delicious. I love the sweet/savory combination, but with the dates AND sugar, it sounds like it could be quite sweet. Would you dust with sugar next time? Oh my word this looks so tasty! I simply MUST make this as soon as possible! Thanks for sharing! Looks absolutely wonderful. A question, is the saffron necessary? I know it's quite expensive and somewhat hard to come by. That is a gorgeous dish! Your pastilla looks really tasty! This is one of those perfect, perfect dishes because the flavors are complex! The sweet and savory combo is already delish, but once you combine the soft, warm inside with a crisp crust, it's maaaaaagic. How interesting. I'd never heard of this dish before but it certainly sounds and looks good. Dang! Why did I cook my chicken before I looked at this recipe? I love, love love this recipe! I love sweet and savory! I have to try this. Kevin…this is seriously over-the-top gorgeous! I've gained two dress sizes just reading it! How beautiful!!! Sounds and certainly looks good. Amazing! Love the combination – can't even imagine how it will taste, but I have all the ingredients and I'll be making it this weekend! Love your recipes! Impressive Kevin. I've never had pastilla before. Looks yummy. Picky 1: I only used a light dusting of the powdered sugar on top and it did not really affect he overall sweetness of the pie. Kaylie: Yes, you can easily skip the saffron. This is a fairly complex dish flavour wise and you won't miss one the subtler notes too much. Wow, this looks delicious! Definitely want to try this one out. I had tried bastilla once and liked it, but I think your version with the dates will turn out more moist. Nice going, Kevin! This looks amazing! I can't wait to try it. I love your blog, the food is amazing and the photography is excellent. You are definitely a source of inspiration. I am such a date fan. This is fantastic. Thanks! i LOVE pastilla: when I was in Morocco we had it almost every day (including a version made with the traditional pigeon…) I always think about making it and then don't do it… thanks for the inspiration! I have had this dish before and this recipe sounds right on point. Beautifully delicious!